We undertook this audit at the request of the Atlanta City Council, which requested information on the effectiveness and efficiency of the agency’s operations and verification of the number of clients who use its services and receive training and job placement. City Council also requested that we review prior audits and reviews of the agency. 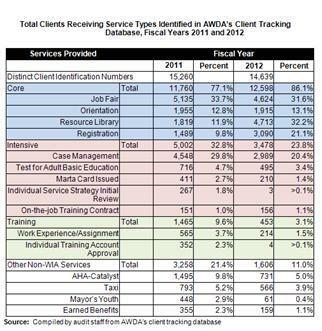 AWDA has no systematic information on performance outcomes for 88% of clients entered into AWDA’s client tracking database. AWDA registers only about 12% of its clients into the state system that allows the state to monitor employment outcomes. State performance reports, therefore, are based on a small subset of clients and provide stakeholders an incomplete assessment of AWDA’s effectiveness. Recipients of intensive or training services are required to be registered in the state workforce system, however, most services provided by AWDA are lower-level core services, such as information about job vacancies, student financial aid, employment trends, interviewing, and resume assistance. The Workforce Investment Act does not require these recipients to be registered in the state system. Agency spending primarily supports staff and is not tied to individual clients, which increases compliance risks. Discrepancies between client records in AWDA’s database and the state system indicate a risk that not all clients who should be entered into the state system have been entered. State and federal auditors have also raised concerns about inability to reconcile financial information, and program reviews have questioned records documenting client eligibility. Neither the state system nor AWDA’s database contains information to match expenses to clients. AWDA’s inability to reconcile grant expenditures with other city reports and budgets has been a long-standing concern. AWDA does not reliably track employers in either the state system or in its own database. The agency therefore lacks information on the extent to which employers participating in job fairs, in the city’s First Source program, or in subsidized on-the-job training have hired AWDA clients. AWDA’s database contains records of employment subsequent to the client’s initial visit for only about 5% of clients. Because we found AWDA’s data to be incomplete and partly unreliable, we conclude that long-term outcome evaluation of their current data is not feasible or cost effective. AWDA’s client tracking database stores unencrypted personally identifiable information, such as social security numbers and birth dates, which also poses significant risk.